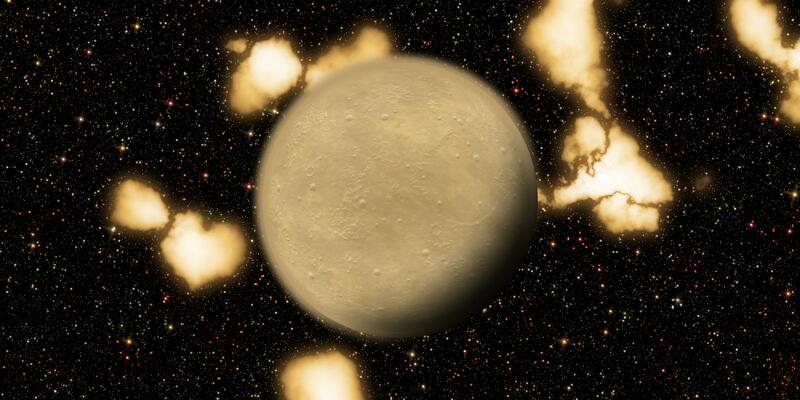 "Arkas initially appeared through the telescope as a fuzzy light brown ball due to it's thick sandy atmosphere, which scientists assumed was just a smudge on the lens. After years of attempting to clean the lens they replaced the telescope entirely, only to discover that the smudge was still there. It took several more months before they realized that the smudge on their lens was actually a planet." Arkas is smaller than Kerbin and even Laythe, having a radius of approximately 0.71 Kerbin radii and exactly 0.85 Laythe radii. Arkas' surface is covered in sandy dunes as well as large, yet inactive volcanoes. Arkas has a golden colored atmosphere with an unknown composition, although the atmosphere is quite dense for a body it's size, having an atmospheric pressure greater than both Kerbin and Eve. Arkas' atmosphere extends up to 80km which is strange considering Arkas lacks the gravitational pull to keep such a dense atmosphere. Arkas also features 17 unique biomes to explore, with biomes for the moons planned for the next update. Arkas was created and was initally developed by user CoriW on the Kerbal Space Program forums, but development has passed on to The White Guardian on the KSP forums, the author of Planet Cyran. Since then two moons have been added to Arkas to further enlarge Arkas' system. Temperature variations created by eccentricity Seasonal temperature variations Temperature changes based off latitude Temperature changes based off time of day Internal mod indexing (just compatibility stuff) 1.2 compatibility of course ;) Fixes for Kras and Vin Biomes for Kras and Vin (each of them having a biome named after who suggested the name for the moon) Scatterer support! EVE support! NEW 'Modular mod' system: add extra features using the Arkas/Expansions directory! Add moons if you want, and add clouds with three different resolutions! New original Arkas cloudmap in the style of SVE and AVP! Available in 2K, 4K or even 8K! Version 2.0 - 1.1.2 release - Added 2 moons - Vin and Kras, can be removed by deleting the folder Arkas/Moons - E.V.E support removed, will be re-added later. Fixed a typo in a filepath before the mod was even published. Thanks for downloading Planet Arkas Development Edition!